A staircase that’s well taken care of can become a lovely focal point in any home. Most staircases are made of wood, and though wood is considered a hardy material, it can split, crack, or receive its fair share of dings and scratches over time. 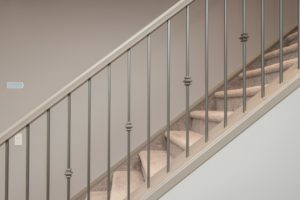 Fortunately, a few simple maintenance tips are all you need to ensure that your staircase is looking its best for years to come. ✓Always clean your wood stairs on a regular basis with either a vacuum cleaner or a soft bristled broom. If you spill something or your stairs get wet somehow, make sure to wipe up spills quickly as water can seep into the wood causing it to warp. If you must use a liquid cleaner, make certain to purchase something formulated for wood stairs. ✓You can easily prevent causing lasting damage to your wood stairs by placing a small area rug near the entrance. Doing so will allow you to take off your shoes and wipe them as a way to prevent scratching the finish. Additionally, don’t wear high heels or shoes that may result in obvious damage or dents in the wood. If you must move your furniture, use padding on the legs to eliminate the potential for dents and dings. ✓If you live in an area with a lot of humidity and moisture, your stairs become susceptible to lasting mold damage. Though you may wipe off the first signs of mold, know that the problem rarely goes away so easily. You need to use a quarter part bleach to one gallon of water. This may seem abrasive, but it is the only way to prevent mold from becoming a recurring theme on your stairs. ✓If you see signs of heavy wear and tear on your stairs, it is possible to refinish small areas. Use a 120 grit sandpaper to remove layers of the old varnish. Once you’ve done that, you must wipe off the old dust and apply the new finish according to the manufacturer’s instructions. Taking care of wood stairs need not be hard! In fact, a few simple tricks and a bit of dedicated time is all it takes to make your wood stairs look as good as new. Exercise caution when choosing stair cleaners, and avoid using anything that may cause permanent damage. If in doubt, hire a professional contractor to do the refinishing for you and they can also make structural repairs.